Banksy put up a new work in TriBeCa at Jay and Staple streets Oct. 15, 2013. 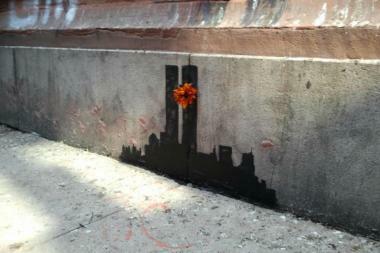 TRIBECA — Banksy has struck again, this time with a 9/11-themed artwork in TriBeCa. The small black silhouette of the Twin Towers appeared Tuesday morning on a building at Staple and Jay streets, with a yellow and orange flower marking the spot where the first plane hit more than 12 years ago. The renowned British street artist has been putting up artwork all over New York City over the past couple of weeks, including a red heart covered in bandages in Red Hook and a man scrubbing a quote off a wall in Woodside. Many of Banksy's stencils were quickly defaced by graffiti. A crowd quickly gathered around the Twin Towers artwork Tuesday afternoon, with many people stopping to take pictures of it. Jessie Samano, 30, an East Village resident, enjoyed seeing Banksy's work pop up unexpectedly. "It's a game he's playing with us and we're playing with him," Samano said. "It's fun."